Billboards popping up around Brisbane are putting faces to the faceless issues of climate change and inequality in the lead up to the G20 summit next week. Oxfam’s poster of a young South Sudanese boy standing in an oversized suit that was put up yesterday, perches high on Melbourne Street in South Bank, while down on Peel Street fire fighter Dean McNulty features on a billboard informing the public on how important climate change is to him. These billboards, backed by national and international conservation groups, sit in stark contrast to the promotional posters of the cultural celebrations happening in Brisbane over the next two weeks. An Oxfam spokeswoman said their billboard in South Bank is intended to call to action the G20 leaders travelling to the Brisbane Convention and Entertainment Centre. “We wanted to place the billboards in a prominent place near the G20 venue to call to action to G20 leaders to take real action during their summit on inequality,” the Oxfam spokeswoman said. 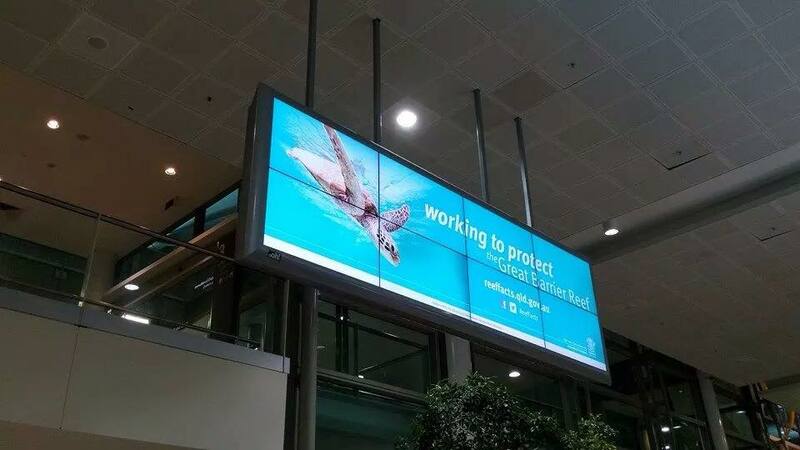 At Brisbane airport, three billboards have already been restricted for being too ‘political’, however Queensland government’s Reef Facts campaign billboard remains. These billboards aimed to promote growing concerns over lack of climate change and poverty discussions and anti-corruption issues calling to be addressed ahead of the G20 summit set to hit Brisbane next week. oOH!Media, who handles Brisbane Airport advertising, told the organisations their billboards were too political, citing BAC’s advertising policy that prevents advertising designed to deliver a political response. However, the Queensland government’s billboard in the arrivals area at the international airport remains. Minister for Environment and Heritage Protection Andrew Powell released a statement earlier this year saying the Reef facts’s intention is to combat the ‘misinformation’ of conservation organisations. A BAC spokeswoman says the Qld Reef facts campaign billboard does not constitute as a political response. Australian Conservation Foundation Climate Change Campaigner Guy Ragen, who is involved with the #onmyagenda billboards, said stopping the signs won’t stop growing public concerns. “They may try to stop a sign but they won’t stop Australians from wanting more renewable energy and less carbon pollution,” Mr Ragen said. WWF will launch a “fair go” petition in response to BAC’s restriction of it’s #onmyagenda billboards, with Farmer David Bruer from the restricted billboard flying to Brisbane specifically to hand the petition to Airport authorities.